Recently, I purchased the book Wild Fermentation. Note, I didn’t say “read the book;” indeed, I haven’t even cracked the cover yet. However, it’s on the soon-to-read list for sure, as it’s been recommended by many friends and well-known websites. I’m sure it’ll be good stuff. I’ve been experimenting with fermenting various books and beverages for awhile, though, such as kombucha, kefir, yogurt, clabbered milk, sour cream and various other stuffs. Most of the time, it turns out well. Today, I things had taken a turn for the worse, though, when I checked the milk I’ve been clabbering for four days. Yesterday, I’d forgotten to check on it, and that probably would have been the perfect time for it to be called done. But I forgot until today. 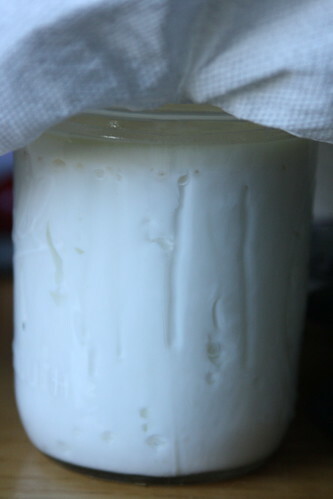 Before I lifted the towel, I could see the milk had begun to thicken and pull away from the sides of the jar. Yay! I was sure I had pure, clabbered gold. Aaaand then I lifted the towel. Those little flecks of yellow and orange sure look like bacterial colonies to me. The white powdery stuff and traces of hairy darker critters look like mold. I figured I’d let it sit for too long. After I scraped the top skin/cream, the clabbered milk underneath smelled fine, and a small taste seemed to indicate it would be safe to eat, but I was suddenly besieged with visions of battling a nasty infection, and tossed it into the compost pile, where the various beneficial bacteria in the milk will do wonders. Later, I conferred with Millie, an experienced clabberer, who said a skin with molds will sometimes develop, and that she usually takes it off and uses the milk portion without any trouble. Well, now I know. Cultures for Health – I have purchased milk and water kefir grains from these folks, as well as a kombucha mother. 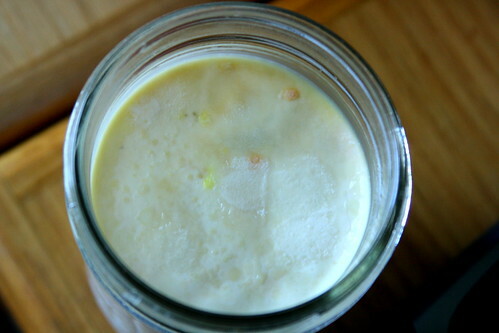 The kefir grains are producing a quart of kefir daily now, but our house isn’t warm enough for them to really proliferate and grow. I just started the kombucha mother a few days ago – it’ll be a month or so before she’s producing. They have a wide variety of products available. Natren Probiotics – I’ve purchased yogurt starters from Natren, and it makes a very tasty product. Oh you are going to enjoy that book so much! Oh neat, nice to see you’ve read it and think highly of it. 🙂 I miss your blog posts! Did you switch from browniepoints to someplace else, or have you just taken a hiatus for awhile? I was just noticing an interesting author connection regarding Wild Fementation- amazon lists Sally Fallon as a co-author. If you haven’t heard of Nourishing Traditions (what I think of as her big book), it’s worth a look through. Right on – I know sometimes it feels like writing a blog entry takes the same amount of energy as walking 20 miles for some reason. I’ve heard a *huge* amount about Nourishing Traditions lately, but geez – I hadn’t paid enough attention to the authors’ names to notice that; thanks. 🙂 It’s definitely on the list!